Alpharetta has over 100 individual neighborhoods such as Windward, Glen Abbey and Palisades at Milton Park are very sought after, but with Avalon opening and the downtown area redevelopment in full swing, other areas are becoming more and more popular. This page will show you a number of predefined ways to search homes for sale in Alpharetta by neighborhood, school district, zip code and more. Search all Alpharetta real estate here. Alpharetta can generally be split into areas east of Georgia 400, west of Georgia 400, or now, Downtown Alpharetta which generally includes Avalon. Avalon and Downtown Alpharetta are on the west side and this area has seen more growth in prices and popularity as the remaining land is converted into new construction homes and neighborhoods. Home prices in Alpharetta average about $350,000 with a range of just under $200,000 for first-time home buyer neighborhoods to well into the several millions of dollars. We can't answer that, but we do get asked that question frequently! The reason there are so many neighborhoods is that they are each a little different and the locations play an important role. If you commute into the city, you may limit your neighborhood choices to those near 400 to shorten that trip. Maybe you work from home and living more towards Milton makes sense. Maybe school choices will play a role. We can help, but this decision is really up to you and your lifestyle. Other Questions About Alpharetta Neighborhoods? Questions about neighborhoods or buying or selling a home in Alpharetta? For more information about homes for sale in Alpharetta, or to schedule a home showing, please contact one of our Alpharetta real estate agents today at (770) 604-1860. 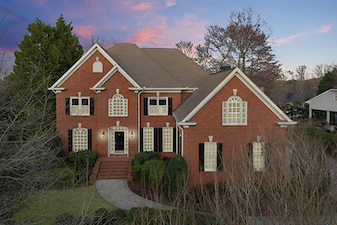 Because the schools in Alpharetta are so sought after, sometimes it's easier to find a home and neighborhood once you know you are in the school district of your choice. If you know you would like to be in a specific school district, you can start your search here. If you have a preferred zip code and would like to search for homes in that zip code and neighborhood, you can do that here.